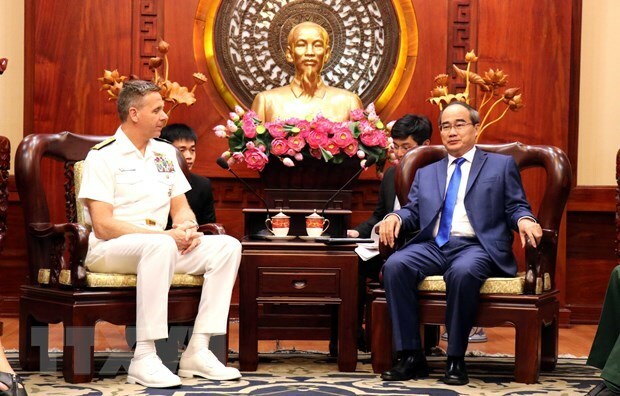 HCM City (VNA) – Politburo member and Secretary of Ho Chi Minh City’s Party Committee Nguyen Thien Nhan hosted a reception on April 17 for visiting Commander of United States Indo-Pacific Command (USINDOPACOM) Admiral Philip Davidson. Welcoming the first visit to Ho Chi Minh City by the commander, Nhan affirmed that the visit will help enhance the fine Vietnam-US cooperation. He thanked the US for supporting Vietnam in dealing with dioxin and training Vietnam’s peacekeepers. Ho Chi Minh City hopes to intensify collaboration with the US, thus contributing to fostering Vietnam-US comprehensive partnership, for the benefits of the two countries, the regions and the world, Nhan added. Davidson said that the US wants to boost cooperation with Vietnam in numerous fields, including in training of the UN peacekeeping forces, exchanges between the two navies, and humanitarian relief.